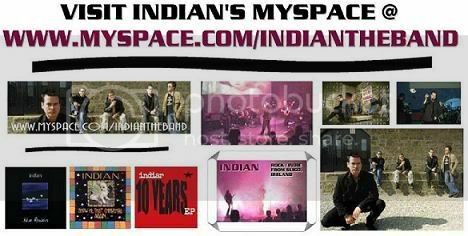 TAKEN FROM INDIANS CURRENT ALBUM - "BLUE FLOWERS"
TAKEN FROM INDIAN'S CURRENT ALBUM - "BLUE FLOWERS" *short-listed for an international songwriting award in Nashville. TAKEN FROM 10 YEARS E.P. PERFORMED LIVE IN GALWAY...REALLY SHOWS THE CELTUS INFLUENCE THAT PAT MCMANUS BRINGS TO THE BAND. UNRELEASED SPECIAL MIX OF THIS SONG. TAKEN FROM INDIANS DEBUT ALBUM - "SHOW ME THAT CHIHUAUA AGAIN"
Blue Flowers is a sublime collection of melodic rock songs from Irish group Indian. Indian mine a rich vein of male/female relationships to produce a collection of songs you'll play over and over again. Blue Flowers features standout track, Cities, which was short-listed for an international songwriting award in Nashville. Heard Indian, "Blue Flowers" in Galway this summer....by accident. I call it the free CD with rental car purchase. Hit play on the CD player by chance just to see if it was loaded or empty, and boom...there you go "Indian". I don't believe your music is playing in Florida yet, not sure about the rest of the states. If you like I have a friend who is with Beasley Broadcasting, controls many stations. If you like, I can give them your CD or please send your CD's to a few stations over here. I would love to hear more. Opps...cut off. Send your material to some stations over here in the States. Best of luck....a very talented group of artists, you are "Indian"
* Your song 'EDGE OF THE KNOWN WORLD - new mix' has just been added to Station 1252 station! * Your song 'EDGE OF THE KNOWN WORLD - new mix' has just been added to KIAC Hitline station! * Your song 'EDGE OF THE KNOWN WORLD - new mix' has just been added to NATURE ENTER ME! station! * Your song 'EDGE OF THE KNOWN WORLD - new mix' has just been added to SILVERWOODS TOP 50 station! * Your song 'EDGE OF THE KNOWN WORLD - new mix' has just been added to FAME & GLORY station! * Your song 'EDGE OF THE KNOWN WORLD - new mix' has just been added to KIAC Hitline Reviews station! * Your song 'EDGE OF THE KNOWN WORLD - new mix' has just been added to Five Gems station! * Your song 'EDGE OF THE KNOWN WORLD - new mix' has just been added to PRESS PLAY station! * Your song 'EDGE OF THE KNOWN WORLD - new mix' has just been added to This Just In station! * Your song 'EDGE OF THE KNOWN WORLD - new mix' has just been added to Fem til Danmark station! * Your song 'VIVA LOVE' has just been added to Low Hanging Fruit station! * Your song 'YELLOW SKY' has just been added to Easy Listening/Soft Rock station! * Your song 'VIVA LOVE' has just been added to Pop station! * Your song 'VIVA LOVE' has just been added to KIAC Platinum Hits station! * Your song 'HEART ON MY SLEEVE' has just been added to My Heart Aches station! * Your song 'FOOLISH' has just been added to Rock Quotes station! * Your song 'EDGE OF THE KNOWN WORLD - new mix' has just been added to Diane's Place station! * Your song 'HOLDING MY BREATH' has just been added to anti-racing cap station station! * Your song 'YELLOW SKY' has just been added to ALTERNATIVE ROCK BALLAD station! * Your song 'SUGAR CUBE' has just been added to eYe station! * Your song 'CITIES' has just been added to Hello Music station! * Your song 'ELVIS N' SPIDERS - e.p. version' has just been added to This Just In station! * Your song 'ELECTRICITY' has just been added to - 90 - station! * Your song 'ELVIS N' SPIDERS - e.p. version' has just been added to Nathan's Picks station! * Your song 'ELVIS N' SPIDERS - e.p. version' has just been added to Render Unto Little Caesar station! * Your song 'VIVA LOVE' has just been added to Sonic Amplitude station! IAC Your song 'VIVA LOVE' has just been added to Now Playing station! * Your song 'CITIES' has just been added to Greatest Clicks station! * Your song 'HOLDING MY BREATH' has just been added to Dark station! * Your song 'BREATHE IN TIME' has just been added to Greatest Clicks station! * Your song 'SWEET ANGELS' has just been added to Low Hanging Fruit station! * Your song 'FLYIN' SOLO - LIVE' has just been added to SOUND CHECK station! * Your song 'SWEET ANGELS' has just been added to The IMP station! * Your song 'FLYING SOLO' has just been added to All About Fly station! IMP Your song 'HOLDING MY BREATH' has just been added to Greatest Clicks station! IMP Your song 'VIVA LOVE' has just been added to Greatest Clicks station! IAC Your song 'BUNNY SUIT' has just been added to Rabbit Punch station! IMP Your song 'VIVA LOVE' has just been added to Moody, Cool, Psychotic, and Mesmerizing station! IMP Your song 'VIVA LOVE' has just been added to Musings station! IMP Your song 'VIVA LOVE' has just been added to JUST LISTEN! station! IMP Your song 'ARCHANGEL' has just been added to JUST LISTEN! station! IMP Your song 'EDGE OF THE KNOWN WORLD - new mix' has just been added to My Station for Holding 'Dead' Songs station! IMP Your song 'EDGE OF THE KNOWN WORLD - new mix' has just been added to Moody, Cool, Psychotic, and Mesmerizing station! IMP Your song 'VIVA LOVE' has just been added to Choice station! IMP Your song 'WHITE DIAMOND' has just been added to Diamonds station! IMP Your song 'TRAMPED THRU' THE WORLD' has just been added to EULOGY station! IMP Your song 'ASSASSINATION' has just been added to JUST LISTEN! station! IMP Your song 'ASSASSINATION' has just been added to eYe station! IMP Your song 'ASSASSINATION' has just been added to Big Mouth Promotions station! IMP Your song 'CITIES' has just been added to Greatest Clicks station! GIG - AUG 6TH 2006 at GRANGE MUSIC FESTIVAL, SLIGO - HEADLINE ACT !! *****HOLLYWOOD ENDING***** thanks!! would love to get on this! !